For the series of Family Guy episodes, see Road to... (Family Guy). Road to ... is a series of seven comedy films starring Bing Crosby, Bob Hope, and Dorothy Lamour. They are also often referred to as the "Road" pictures or the "Road" series. The movies were a combination of adventure, comedy, romance, and music. The minimal plot often took a back seat to gags, many of them reportedly ad-libbed by Crosby and Hope during filming. Each film is not simply a comedy, but a satire of some of the popular film genres of the day, including jungle, Arabian nights, Alaskan adventure, and high seas. In 1977, an eighth Road to... movie was planned, titled Road to the Fountain of Youth; however, Crosby died that year of a heart attack. In 1947, Astor Pictures released a compilation film of several of Crosby's Educational Pictures short subjects called The Road to Hollywood to evoke the series. The United States Navy also commissioned Hope and Crosby to produce the 1945 short film Road to Home. In Sweden, the first film was given the title Två glada sjömän går iland (Two Jolly Sailors Go Ashore), which led to the subsequent films in the series all being given a title beginning with Två glada sjömän ..., except for the last film, which was instead called Vägen till Hong Kong (a direct translation of the English title). In the 1980s, Eric Idle wanted to make a "Road..." picture called The Road to Mars, but was so put off by the executive meddling done at Hollywood studios, that he decided to do it as a novel instead. The films have a complex ownership history. Singapore through Utopia were originally released by Paramount but these films, which were part of Paramount's pre-1950 "classic" library, ended up with EMKA, Ltd., today part of NBC Universal Television Distribution, with sister company Universal Studios handling theatrical and video distribution. Rio and Bali were made jointly by Hope and Crosby and released through Paramount. Distribution for Rio today rests with Sony Pictures Television and FremantleMedia. Bali's copyright was erroneously renewed one year too late and thus lapsed into the public domain in 1981. Road to Rio has been preserved by UCLA Film & Television Archive. The final "Road" film, The Road to Hong Kong, was released through United Artists, which still owns it via its sister company Metro-Goldwyn-Mayer. SPT co-distributed the film on television for a short time after a Sony-led partnership bought MGM. Beginning with Road to Singapore the films also included in-joke references to other Hollywood actors and jabs at Paramount Pictures, the studio that released all the films except for The Road to Hong Kong. There are also frequent instances in which Bob Hope breaks the fourth wall to address the audience directly, such as in Road to Bali, in which he says, "[Crosby]'s gonna sing, folks. Now's the time to go out and get the popcorn." Hope and Crosby would usually play some form of confidence men trying to make a lot of money, with Bing coming up with the ideas and Bob usually doing most of the dirty work. When confronted by the villain, Hope and Crosby would use a "patty cake" routine before throwing punches, though this would sometimes not work, as in Road to Morocco: "That gag sure gets around, huh?" "Yeah, right back to US!" The only film in the series in which the routine was not used was in Road to Utopia. Both characters would usually promise to not allow women to interfere with their plans, and both would immediately see a woman and forget that promise. Crosby would almost always get the girl, with the exceptions being in Road to Utopia and Road to Rio (although hypnosis was involved in the latter case). 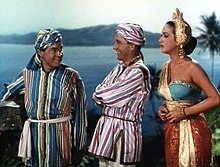 Hope's character usually would have a nickname with which he would be referred to throughout the film, as in Road to Morocco, when he was called "Turkey", and Road to Zanzibar, in which he was called "Fearless". Hope would also break the fourth wall continuously to over-act, often with an upbraiding from Crosby. Hope would then blame his overacting on his attempt to win an Oscar. In reality, Hope never won any Oscar for his work, although he did receive honorary Oscars. Later, when Hope was a regular Oscar host, he incorporated his "Oscar bait" whines into his monologues there. The 1944 Famous Studios Popeye cartoon "We're On Our Way to Rio" is a parody of these films. The April 20, 1966 episode of The Danny Thomas Show, titled "The Road to Lebanon," featured Bing Crosby scouting locations in Beirut for a new Road picture without Bob Hope. In the 1981 Mel Brooks film History of the World, Part I, on escaping from the Romans, Brooks and co-star Gregory Hines parody the series' "We're off on the road to..." signature song by singing "We're off on the road to Judea, we certainly do get around..."
The 1985 film Spies Like Us, starring Dan Aykroyd and Chevy Chase, is an homage to the films; Hope makes a cameo as himself in one scene. The phrase "Road to Dushanbe" is uttered several times throughout the movie. Dushanbe is near the ultimate destination of the protagonists. The 1987 film Ishtar was envisioned by writer/director Elaine May as an homage to the "Road" series. The 1990 They Might Be Giants song "Road Movie to Berlin" references the films in its title. The TaleSpin episode "Road to Macadamia" pays tribute to the series, including spoofs on the songs. Three episodes of the 1991-1995 animated series Taz-Mania spoofed the Road to.. movies, starring Hugh Tasmanian Devil (Taz's father, a Crosby parody) and his brother Drew Tasmanian Devil (parodying Hope). The episodes were "Road to Taz-Mania," "Return of the Road to Taz-Mania Strikes Back" and "Yet Another Road to Taz-Mania." The Duckman episode "Road to Dendron" spoofs the series. The 2000 animated film The Road to El Dorado is an homage to the Road movies. In the 2001–2003 Disney animated series The Legend of Tarzan, the characters Hugo and Hooft are loosely based on Hope and Crosby (though not in appearance). The animated TV series Family Guy has had eight "Road to ..." episodes that spoof the original Road pictures, starring Brian and Stewie Griffin: "Road to Rhode Island", "Road to Europe", "Road to Rupert", "Road to Germany", "Road to the Multiverse", "Road to the North Pole", "Roads to Vegas", and "Road to India". In addition, the series' 2009 episode "Spies Reminiscent of Us" is an homage to Spies Like Us, even guest starring Aykroyd and Chase, which in turn was based on the "Road" films. ^ "The 'Road...' Films of Hope, Crosby and Lamour". h2g2. 2004-10-09. Retrieved 2009-10-25. ^ "BING magazine". BING magazine. ^ "Elaine May in conversation with Mike Nichols". Film Comment. July–August 2006. "The Road to Bali". Internet Archive. Dec 6, 2016. This page was last edited on 5 December 2018, at 07:42 (UTC).